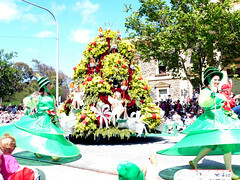 Yesterday we got up quite early to go into town to see the annual Christmas pageant. The people we ended up sitting with (friends of friends) got there at 6am to get a prime spot. I found it hard enough getting up at 6.30am to have breakfast and get in there. By the time we got in at 7.30 the streets were packed with people waiting for a 10am kickoff. It’s the first pageant I’ve gone along to since I was a kid myself and therefore the first time JJ has been. He really enjoyed it and kept asking when Santa was going to come along. Halfway through the pageant he turned around and told me he really needed to go to the toilet. I told him that if we left we’d never make it back and he’d miss Santa. He managed to hold on until after the end. We went back to a friend’s place afterwards and ended up staying there for the rest of the day. It was great fun – even for me.